Elon Musk, CEO of Tesla and SpaceX, is never one to do things that don’t get noticed. 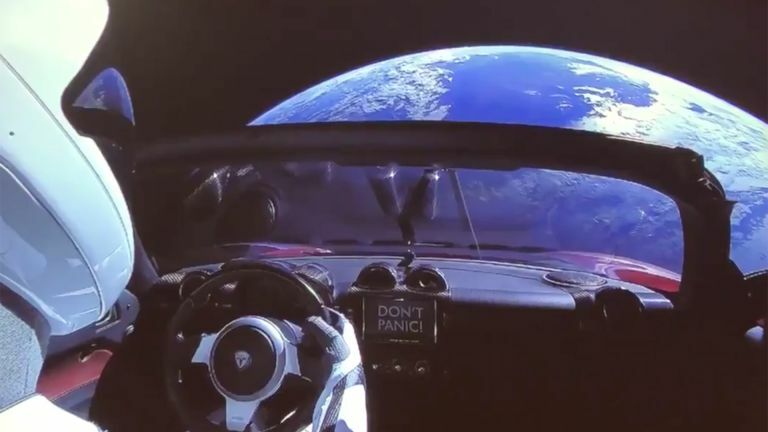 So when SpaceX launched the world’s most powerful rocket since the shuttle system, dubbed the Falcon Heavy, he decided that wasn’t enough and bunged a Tesla car on there too. The Tesla Roadster was sent up with the rocket and is now in space with a video feed which you can watch back right now. The Falcon Heavy was the most powerful rocket to launch since the shuttle system and represents our chance to get to Mars becoming a reality. This beast is able to delivery a maximum payload of 64 tonnes, which is about five London double–decker buses. According to Musk this is double the performance of the world’s most powerful rocket and done at one third of the cost. So why the car? In order to weigh this test rocket correctly there needed to be weight in the nose. While they usually use boring old cement or similar, Musk decided a Tesla Roadster would be more fun. The car even has a dummy driver complete with space suit, dubbed Starman. The car stereo was, of course, set to play David Bowie’s identically named track on a loop. Impressively this launch was only given a 50–50 chance of success. Not only did it launch successfully but the other two stages of the rocket have safely returned to earth ready to be used again. There was a third module but it ran out of fuel returning so couldn’t slow down and was destroyed on impact with the sea at 500 kph. The car is now in space on a trajectory to Mars, just as Bowie would have wanted.